A collaborative research with Stanford titled Stanford Project on Japanese Entrepreneurship (STAJE) is going on since last year. We set this up jointly with people from Stanford including Dr. William Miller, a former Vice President well known for "MOT" and we had an open symposium at the University of Tokyo on May 29. Dr. Miller and I gave greeting speeches. Dr. Miller is just over 80, but he is still very active and said that he started another new business lately. 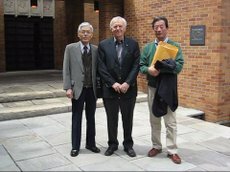 Professor Shigeo Kagami of Todai and Professor Robert Eberhart are the organizers. As for my part, my message to the audience was that "eco-platform", the "Kurofune (U.S. battleship that arrived in Uraga in 1853 to negotiate opening of Japan for trade)", pressing for the opening of the country and innovation has come; last week TEDxTOkyo and next week the opening of TiE Tokyo Office. It was a rainy day, but I was told later that approximately 250 people gathered and joined in very lively discussions (I had to leave the place for a while and miss some of the programs). Forbes reports on this symposium. We talked about the advantages that Japan and Silicon Valley have respectively, but I will leave the details to the report that is coming soon. Japan has countless possibilities. What we need is action. It’s "Think Locally, Act Globally" (the article is in Japanese only). I intend to think of some ideas for fermentation with several partners. Over these 20 years and more, I have been pointing out the importance of having young people involved in competition away from home ground (Taryu-jiai) in the world. Professional sports opened up their doors to the world too; Nomo in 1995 in Major League, FIFA World Cup and J League. These sports earn high television viewerships in Japan just like in any other countries ? the goals and values of young people are changing to the same direction as the young people in the rest of the world. Even Sumo, the 'National sport' of Japan, have internationalized totally and the last two matches in the last two days of latest summer tournament were done by non-Japanese only. The rates of number of foreign rikishis (sumo wrestlers) were in grand total 7%, Makuuchi 30%, Sanyaku 40%, and Yokozuna 100%. Nevertheless, I don't think Japanese are being especially furious or anything about this. Japanese also cheer for their good plays, and at the same time this in effect spreads the value of Japanese cultures to the world. People liking Japan will increase through such experiences. Yes, the basis of a nation is human resource development and this is the most important task for the future of Japan. For the coming global age nothing is more needed than to urge young people to see the world outside ? in order to recognize the differences or variety of people of the world, the value of oneself and to build up global networks of friends and colleagues for their future. This is the recommendation I have been proposing repeatedly in my website. In this year's January/February issue of 'Foreign Affairs,' Dr. Anne Marie Slaughter, Dean of the Woodrow Wilson School of Public and International Affairs at Princeton University, wrote a wonderful paper. When I compare this with the universities in Japan, I feel very uneasy and worried about the future of Japan. Dr. Slaughter was appointed to the Director of Policy Planning of the U.S. Department of State starting from the end of January. A nice selection! Now, can Japan change? Ozumo-nization of universities and industries are so tardy ? too many professors and CEOs are interested in domestics only, don't you think? Please search within this website by various key words as the ones I have highlighted in Bold. "TED comes to Tokyo." And if your response to this news is "finally!" or "at last!," then you must be a kind of freak(?) in this area. But believe it or not, it actually did. On May 22, TEDxTokyo was held at the National Museum of Emerging Science and Innovation in Odaiba. The audience was limited to 200, language was English exclusively, and the percentage of Japanese participants was limited to maximum 40%. I was involved in organizing this event, and we arranged to have each live speaker speak no more than 18 minutes. We also sorted out several nice videos from TED and mixed them into the program. It turned out to be a very exciting and inspiring day. The two producers, Todd and Patrick, were nice combination and the way they hosted the event was in a good tempo and stylish. Visit the TEDxTokyo website or the original TED site and have lots of fun. Thanks to so many young volunteers who helped this happen. Recently we have had a number of topics related to Canada (Ref. 1, 2) and I assume that this is partly because this year is the year of 80th anniversary of Japan-Canada relations and more exchanges/events are taking place than usual. Ms. Olivia Chow, member of House of Commons of Canada came to my office at GRIPS with Mr. Christopher Burton, First Secretary (Political) at the Canadian Embassy. Dr. Sunami and I have just returned from Toronto, so there were lots of topics to share. The time just flew away. 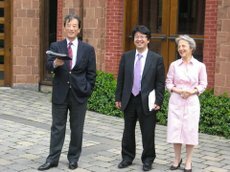 Ms. Chow said that she and Prof. Ito Peng were colleagues. You never know who is connected to whom. And I tell you this is exciting. No matter where you are or whenever it is, you will be evaluated as an "individual" and will be connected to even more friends and colleagues. Needless to say Chateau Margoux is the most prestigious wine estate representing Bordeaux; "the Queen of French Wine." I was invited to a gathering of tasting Vintage wine from the brewery and had a wonderful time with nice people and good food. Mr. Paul Pontallier, the manager of Chateau, also came directly from Narita. After Champagne Cattier Clos du Moulin, below were served in the order of the list. The last 3 wines, like others, had unique tastes respectively. ‘ 95 was strong and complex, maybe good in 10~20 years from now, ‘ 89 was just right, very feminine and round. ‘ 82 had power and thickness. Just a while ago, I also tasted Chateau Mouton Rothschild 1953, etc..
Toast for good friends ! Seize the Opportunity, Time for Big Change. But Where are Leaders? Situation of Japan is not good at all. Of course, same can be said for the rest of the world. Everybody is trying to make changes and searching for future perspectives of politics, industry, economy, education, etc. As for the national vision as I see it, I have been sending out messages again and again from the start of the New Year. On the April 25 issue of Diamond Weekly Magazine(in Japanese only) an article based on interview with me was published under the title of "Let Japan go and sell clean energy technologies to China & India ! "(the article is in Japanese only). Here, as always, people give countless reasons why they cannot change, why they cannot do. In politics, industries, or whatever, I urge the leaders to straighten up. Mr. Hatoyama was elected the President of the Democratic Party. How will the politics move? In Japan, people are talking mostly about the revised budget which is almost "dumping" of public resources, and this is greatly affecting the political situation. It appears to be "scattering money" to vested interest groups, "lucky dips" by Ministries and Departments. No one is drawing visions for the future nor seizing this rare chance for a drastic change. I can even hear irresponsible big laughter of some people. Same thing for science and technology policies. A mega budget of 300 billion yen( 3.1 billion dollars) was appropriated like a bolt from the blue. But for what and how? Please watch carefully. It is of a very different kind compared to the science and technology policies of President Obama. A nation not investing to young generation has no future. It is very important to let young people see and experience the broad world outside so to prepare them for the global age. Young people are precisely "the" asset of the nation in the future. It’s Saturday, May 2nd and the "swine flu" news are all over the place. In the afternoon, I went to the University of Toronto again, this time to the Massey College. The College is located just on the opposite side of yesterday’s Munk Center. I went to see my old friend, Dr. John Dirks who is in charge of the Gairdner award. It’s been 5 years since we met last time. Dr. Arimoto joined us from Washington DC where he was participating in the AAAS meeting. We spent approximately 1 hour in an old fashioned, elegant, somewhat small library of the College. 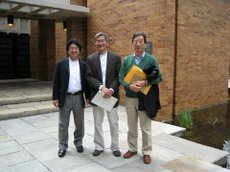 As I have reported in this blog, in the year of the 50th anniversary of the award two Japanese scientists-Drs. Yamanaka and Mori-were awarded so I went to pay a courtesy visit. I also heard about the awarding ceremony that will take place in October as well as various events being planned in celebration of the anniversary. After this, I had an opportunity to see Prof. Jun Nogami. Dr. Nogami is the leading scientist of Canada Nanotech, nano-materials and I met him at the Canadian Embassy in Tokyo this February when he was visiting Japan with Nanotech research promotion inspection party of Canada. Photo1: At the Massey College with Drs. Dirks and Arimoto. Photo2: With Drs. Nogami and Sunami. Then, discussion with Dr. Peter Singer (Ref. 1, 2) on common topics including the agenda of next year’s G8 summit to be hosted by Canada. In the evening, Prof. Ito Peng, her friend, Drs Arimoto, Sunami and I enjoyed nice dinner at "Sotto Sotto". The dessert was of course "Ice Wine." I was told that Japanese are the best customers. After checking in at Le Royal Meridien King Edward Hotel and taking a short rest, I took off for the destination. First destination was a meeting with three people from MCIS, Janice Stein (Director), Judith Wolfson (Vice-President for University Relations) and LJ Edmonds to discuss on this year’s "Japan-Canada amity 80 years anniversary" plan with my colleague at GRIPS, Dr. Sunami. Both parties suggested focusing on "Innovation" in a broader sense. By the way, the three persons from Canada were all female, PhD, Lawyer, Government official respectively, representing a variety of careers which is truly impressive. In the 75th anniversary, MCIS and SCJ (Science Council of Japan) co-organized a conference under the theme of "Gender Issue" that produced an outcome of Japan-Canada academic exchange program for female researchers (this web-site is in Japanese only) . "Asian Foodprints", a series of conferences under the auspices of Munk Center and Asia Institute happened to be open so we decided to have a quick look into them. The first conference was organized under the theme of "understanding cultures through food" and this year’s theme was "China, Hong Kong." It appeared to be very interesting. After this, I left the site for a meeting with the President of University of Toronto. In my last visit five years ago, I had a lunch at the President’s office with current President Birgeneau of UC Berkeley, who was then just about to take on the new appointment. This time, it was Dr. David Naylor (the photo at the top) who succeeded Dr. Birgeneau just recently. Dr. Naylor is MD, and was the Dean of School of Medicine very much like myself. Still young, but has an impressive career and had lots of topics common with me so the meeting turned out to be a lively interesting conversation. 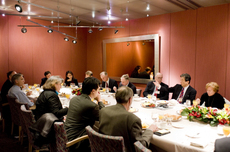 Then, a dinner of "understanding cultures through food" hosted by Munk Center and Asia Institute. 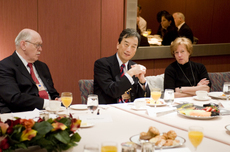 A large number of guests were invited, including Dr. John Wong (Director), Professor Ito Peng , Drs. Stein, Wolfson and Edmonds. It was a wonderful event overall. Next year’s theme will be Japan. At the dinner I had an opportunity to see Mr. Yamashita, Consul General of Japan in Toronto, President Suzuki of the Japan Foundation and his wife. In July, His Majesty the Emperor and Her Majesty the Empress will visit Canada. I am delighted to report to you that this was also a hot topic at the event. 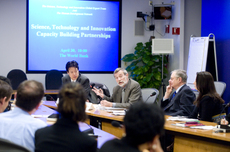 I did a lecture at the World Bank in January 2008 (Ref. 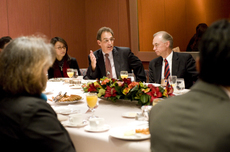 1, 2 ) and right after that we co-organized a Global Health Summit in Tokyo in February 2008. I believe that these activities were very helpful in building strong mutual trust and understanding. During my visit to Washington DC, from the morning of April 30, schedule was arranged for me to discuss about science and technology policy with special focus on African development for 4 hours. What role is the Science and Technology policy of the World Bank capable to play to address the global issues of today’s drastically changing world is a great challenge. It was a good opportunity to advertise Japan’s policies since Japanese delegates had just returned from their tour on Science and Technology in Africa and their findings were reported at a conference in Tokyo recently. JBIC (Japan Bank for International Cooperation) and JICA (Japan International Cooperation Agency) also participated from Japan and contributed to making the discussion lively. It was well received. 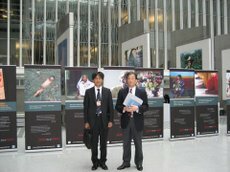 Photo1: At the World Bank with Secretary Ueda of the Embassy of Japan. Below are some of the scenes from the Science, Technology and Innovation Capacity Building Partnership Meeting at the World Bank . Expectations of the world is high for Japan and indeed Japan is capable in making large contributions in many different ways but it seems to me that current domestic climate is somewhat sadly introverted. For current crisis, it is crucial for the political leaders to catch this opportunity of "once in 100 years" disaster to show national vision that shows strong determination to change reluctant Japan to meet today’s global needs. If not, the cool-headed world would treat Japan accordingly; as a nation not-worth-taking-seriously, and no international negotiations or top diplomacy would make meaningful differences whatsoever (by Funabashi, Editor in Chief). How much are we, although still economically the 2nd largest, communicating to the world our will, determination, and policies and how seriously does the world take them? I regret to say that "Japan Missing" is the world’s feeling towards our nation. There are many think-tanks in Washington. Among them CSIS, Brookings are well known in Japan also. Some Japanese go to these think-tanks to study, but I think their number is too small for a nation of the 2nd largest economy in the world. It is important to be in those think-tanks not only to gain knowledge but also to make connections in Washington, to understand how the politic works and how policies are made. We should be more seriously involved in this. Atlantic Council is another example of those think-tanks. Its works are very closely related to politics. Mr. Kempe, after a long and prominent career at Wall Street Journal, has become President and Chief Executive Officer of the Atlantic Council and its activities are expanding ever since. National Security Advisor is known to be the most important post in the White House and General James Jones, the former Chairman of Atlantic Council, was appointed to take this position. As you may see from the website of Atlantic Council, the organization was established in recognition of the importance of relations of Atlantic community of both sides. To meet the challenges of this global age, the Council is actively working and reporting on U.S.-China relations, new energy, etc. as well as on Asia. Here again, I must say that Japan’s presence is extremely weak. I attended 2009 Leadership Award Dinner by invitation from Mr. Kempe. About 900 people were there. Please visit the website by all means. Since this year was the 20th anniversary of the fall of the Berlin wall, awards were given to the top of the United States and West Germany of the time; former President Bush (the father) and Prime Minister Kohl as well as IBM Chairman of the Board Mr. Palmisano, General Petraeus, and Thomas Hampson (a singer). Former Secretary of State Mr. Colin Powell, Secretary of Defence Robert Gates and many government high officials, legislators, Ambassadors from 46 countries, etc. were there at the party. It was truly a fantastic gathering. My seat was next to Ambassador Fujisaki. Speeches by the recipients were nice too – they all looked very comfortable in giving speeches. General Petraeus’ "joke" was fun. I invite you to listen to them on the web. I also saw several friends from China. They were all at one table inviting Chinese connections.